Hatters boss Nathan Jones believes that his newly put-together squad is already showing signs of real ambition for the season ahead. 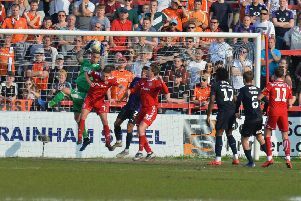 Luton are aiming to go one, if not two steps further than last season, by not just winning promotion automatically, but with the players brought in over the sumer, a tilt at the League Two title is now fully expected. I wanted them to come back with ambition, with a real hunger to do well and they’ve all done that. After returning to pre-season training last week, Jones has been left hugely impressed by the early signs, saying: “The lads have come back very well, which I knew that they would because of the disappointment of last year, they wanted to put that behind them as soon as possible. “I wanted them to come back with ambition, with a real hunger to do well and they’ve all done that. “The new ones we met in the summer, that was a prerequisite really. We wanted hungry ones, we wanted ones that whatever stage of their career they were, wanted to improve, want to get better and want to take us forward. Meanwhile, Jones believe that the new additions will only improve Town’s chances of coming out on top in the high-profile matches this term, as the likes of James Collins, James Shea, Andrew Shinnie and Alan McCormack have already won promotion in their careers. He added: “We wanted to add quality to the side, we wanted to add even more competition, we think we’ve done that. “We had a little bit of naivety in our side last year. We were a very good, young, energetic side, we wanted to play well, played with a tempo, but when it came to big games, we probably just lacked a little bit of know how really.